An oceanic plateau (also submarine plateau) is a large, relatively flat submarine region that rises well above the level of the ambient seabed. While many oceanic plateaus are composed of continental crust, and often form a step interrupting the continental slope, some plateaus are undersea remnants of large igneous provinces. These were formed by the equivalent of continental flood basalts such as the Deccan Traps in India and the Snake River Plain in the Pacific Northwest of the United States. There are over 180 oceanic plateaus covering an area of 18,486,600 km2, or about 5% of the oceans. The South Pacific region around Australia and New Zealand contains the greatest number of oceanic plateaus (see map). Geologists believe that igneous oceanic plateaus may well represent a stage in the development of continental crust as they are generally less dense than oceanic crust while still being denser than normal continental crust. Density differences in crustal material largely arise from different ratios of various elements, especially silicon. Continental crust has the highest amount of silicon (such rock is called felsic). Oceanic crust has a smaller amount of silicon (mafic rock). Igneous oceanic plateaus have a ratio intermediate between continental and oceanic crust, although they are more mafic than felsic. 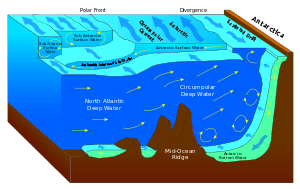 However, when a plate carrying oceanic crust subducts under a plate carrying an igneous oceanic plateau, the volcanism which erupts on the plateau as the oceanic crust heats up on its descent into the mantle erupts material which is more felsic than the material which makes up the plateau. This represents a step toward creating crust which is increasingly continental in character, being less dense and more buoyant. If an igneous oceanic plateau is subducted underneath another one, or under existing continental crust, the eruptions produced thereby produce material that is yet more felsic, and so on through geologic time. ↑ oceanic plateau. (2008). In Encyclopædia Britannica. Retrieved December 16, 2008, from Encyclopædia Britannica Online. ↑ Uenzelmann-Neben, G., K. Gohl, A. Ehrhardt, and M. Seargent (1999). Agulhas Plateau, SW Indian Ocean: New Evidence for Excessive Volcanism, Geophysical Research Letters, 26(13), 1941–1944.